Writing memoir is like drawing a self portrait while looking in the mirror. Sort of. Don’t be surprised if your picture turns out backwards. Which may not be such a bad thing! And so I began . 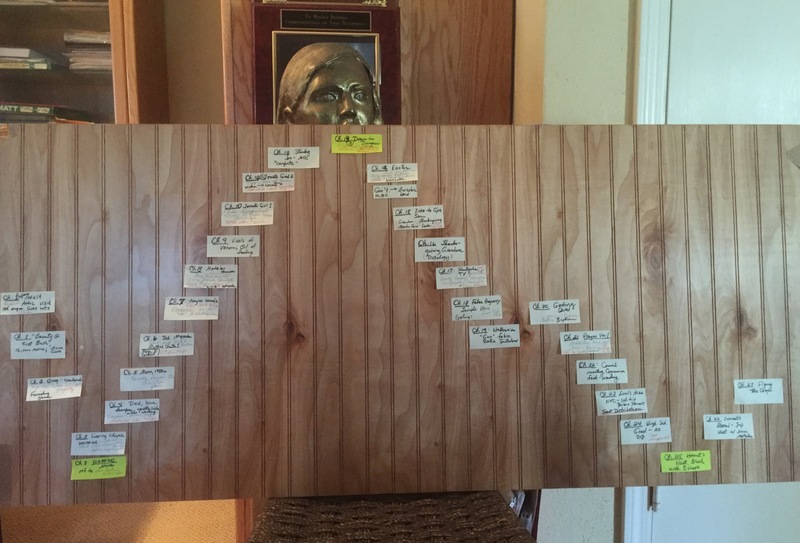 . .
Two and one-half years ago after taking an online memoir-writing course, I constructed a timeline of my memoir, using neon-colored stickies unfolding in scenes. Being a visual learner, I proceeded to put heart and soul into plotting my story. Then I took another online writing course. This time a male voice, surely in touch with his feminine side, assured me: “Plumb your emotional depths. 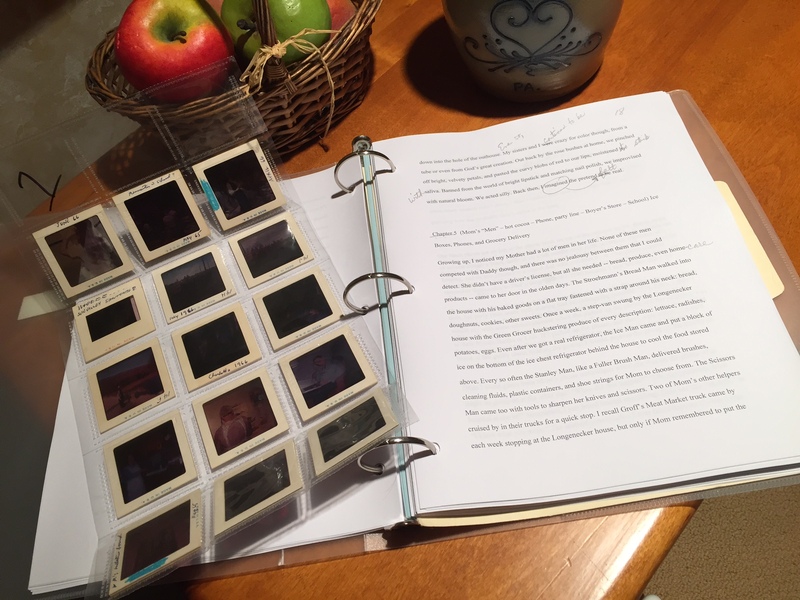 The narrative arc of your story will reveal itself.” Sort of like a developing a Polaroid print. Off went the multi-colored stickies. This time my notes formed a different shape. It turned out, though, that the tip of my narrative arc was merely the climax of one dramatic scene. Undaunted, I soldiered on, going back to the drawing board. 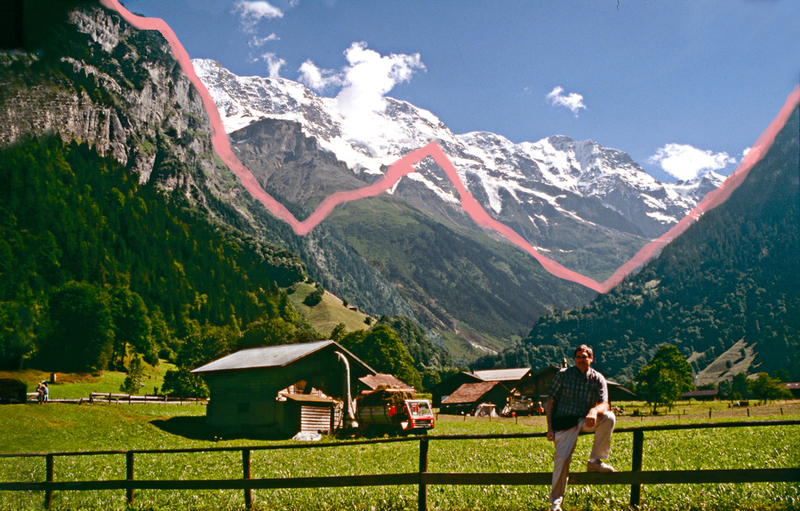 In this post, I drew an analogy between a Swiss Alp and the arc of my narrative. “What is your story about, Marian”? “Isn’t it obvious?” I thought. “Apparently not,” I sighed, reflecting on my own query. Otherwise, why would they ask such a question? Two and one-half years later, that’s where I am now, revising scenes, editing, re-arranging order of chapters . . . re-visiting memories. Tracing one’s story with a certain strategy may lead to a dead-end. Wise counsel from others doesn’t necessarily translate to a good outcome – either because you misunderstood exactly what was meant OR the suggestion doesn’t fit your story OR because it’s not time to execute this strategy OR because _______­­­­­­______________. Myth is tangled with mystery. Memoir is tricky business. Memoirists are so familiar with their life story that they fill in the gaps in their minds without bringing the reader alongside on the page. Thus, the “thread” of their story may be lost. “Everything will be all right in the end. So if it is not all right, it is not yet the end,” says young Sonny in Best Exotic Marigold Hotel. Debby reblogged 5 tips for writing a memoir which you can read here. You also join her walk down memory lane in this post with writing prompts. Strive always to be truthful, but recognize that your truth may not always match the memory of others in your life. Choose those whose opinion matters most to you and share your story with them. Listen to their critique, but only change your work if you were wrong about factual details, time sequence or other external forces. Your feelings and thoughts are your own, and you need to find your own internal truth. Here is where to find her sensible defense of leaving such a legacy. As a reader, what grips your attention in memoirs or other non-fiction you’ve read? As a writer, what tips can you add? Feel free to add links in comments. How would you fill in the last blank under “Myth”? Overall, memoir brings yourself back to …you. Memoir is hard because we go deep, ignoring what we’ve tried to ignore or deny or color over with pretty wallpaper. Memoir (done right) shows the shape of us, the soul of us. the heart of us. And plumbing into those depths is no easy feat. Many times in my writing classes, I’m not giving a particular prompt to encourage memoir writing, but that’s what happens anyway. Sometimes, the writing table is wet with tears. But those students leave the class thanking me for their tears. They’ve made discoveries. And they’ve found the ‘selves’ they thought lost inside all the ‘stuff’ that happens. Oh, dear, I could go on and on. If you’ve enjoyed your discoveries as you’ve written your memoir, you’ve already succeeded, Marian! You have the heart and soul of a teacher, Pam, and of a memoirist and writer of fiction too. Your comment reminds me of a Robert Frost quote “No tears in the writer, no tears in the reader.” I have been both thrilled and bewildered by the discoveries I’ve made in memoir, so I’ll count that as success. Thank you! Thank you for adding this. I guess I’m not a good fiction writer because my stories are guided by my memory, not my imagination. I must admit my life does surprise me at times though as I search for the origin of some of my emotion and those of others in my “cast” of characters. Yes, it’s like unraveling a scroll. I began memoir looking for answers, some of which were uncovered in Mom’s attic. By the way, you never need to apologize when you add to the conversation here, Pam! That’s what makes this corner rich and wonderful. Thanks again! I’ll admit, your first photo had me salivating, Marian. 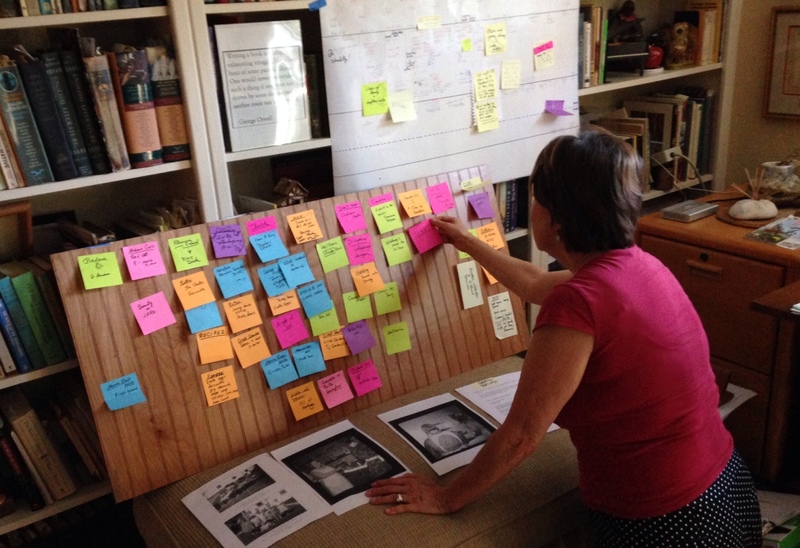 I love to use a storyboard along with florescent Post-its after I’ve written my synopsis. Whether you write fiction or non-fiction, knowing where to start the story can be difficult. I tend to agree with your last reader. Sometimes starting at the end is a good way to hook the reader. Wishing you the best. I hope soon you’ll be able to turn your little sad face into a happy one. I can’t offer any advice on memoir writing, Marian. 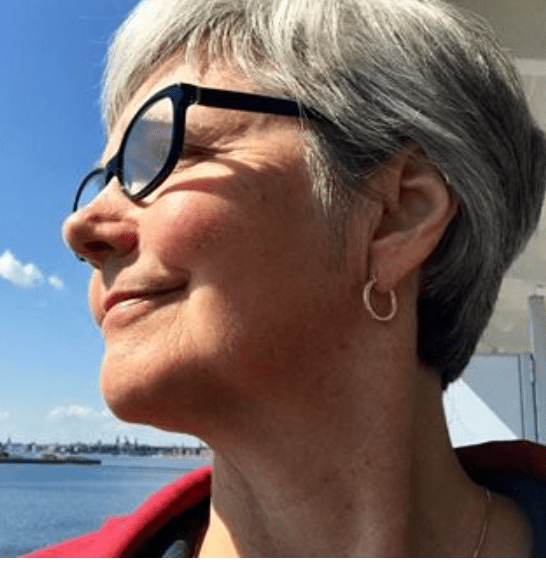 I was trying to think about what grips me in fiction, nonfiction, memoir–certainly an interesting story, but even more so, I think it is the character–and the memoir writer is like a character. I think readers need to relate to her/him, on some level, even if the person comes from a totally different background or culture. It is difficult to know where to start a story, fiction or non-fiction. Sometimes beginning your tale with the end result works, but only you can decide. You’d still get to use your storyboard! 🙂 I might be even more necessary, especially if you’re writing your story like a puzzle where you have to show how all the pieces fit to get that final picture. Good luck! Storyboards, puzzle pieces, they all have their uses, I think. Step by step I’m getting there, just like you writing test questions, editing anthologies, and the part I think you like best of all – poetry. Right? What a fantastic post illustrating that like most everything else in life, one must follow their own way. No one walks the same path you do, Marian. Keep on trucking and write from your heart. Hearts speak to hearts! Oh, Joan, I know you are probably sorting stuff and packing boxes for the big move in November. Thanks for taking the time to encourage me here. You remind me of a writing coach who points out: Personal essays show one mind speaking to another, but memoir is a heart to heart matter. No quite a quote, but that’s the essence. Again, thanks and best wishes for an uneventful move! Marian, you have captured the essence of the memoir writing journey and are well on your way to polishing your work as the story that begs to be told begins to reveal itself to you. Excellent post that I will share. Write on, my friend. The world awaits the story only you can tell. Thanks for reading, commenting, and then going the extra mile to share. You are right to remind us all that memoir is a story only a particular narrator can tell. So much has changed in the era I grew up in, my story could certainly not be duplicated in Mennonite life today. You are such an encourager – thank you, Kathy. I love the humor in the way you tell the story of struggle in writing memoir, Marian. It’s one of the most attractive features of your voice. Love that Swiss mountain vista with your arc superimposed! Sometimes I think the idea of narrative arc is overrated. Plot is only one element of memoir. And it may not be the most important. Maybe I say that because I never found the perfect arc in my own memoir. Voice is just as important. I like Joan’s advice to keep writing from your heart. Heart and humor will lead you to the place you need to go. Blessings. I think your comment has struck on both the myth and mystery of memoir writing. Remember Rick Steves and his European traveling compadres? I heard his producer say once, “When Rick really gets into it, he hits just the right tone, and I know that is footage we can use.” Your point of view and encouragement here has been so valuable – from the very beginning of this journey. I thank you, Shirley, and applaud your own nanny/photographer/writer journey you are documenting this year. Thank you, Marian. I love your Swiss Alp analogy. I also have played with the arc or arcs of my memoir, over and over. I’ve come to appreciate in my memoir writing (still in process) that my capacity to be resilient through life challenges, bouncing back quickly (at least in taking action quickly), seems to level out the extreme arc in certain ways. So, I too need to attend more to the deep emotional jarring at certain points that I carry with me, yet do not disable me. but perhaps not extreme edge moments of my life simply because I kept pushing through them. There was a cost, at times less visible or employed to move forward. If we keep with a mountain analogy, there is a model. Your post helped me recognize it. Thank you again. In the book, Annapurna, A Woman’s Place, by Arlene Blum (reprinted in paperback in 2015), An excerpt reveals the exterior challenges, ” the logistical problems, storms, and hazardous ice climbing; the conflicts and reconciliations within the team; the terror of avalanches that threatened to sweep away camps and climbers.” But the interior challenges for each woman were basically and courageously breathing and taking a step, up the mountain or on an ice ladder over a crevasse, overcoming fears and doubts, taking the next step, again and again. The backdrops of mountain climbing are stunning, the climbing itself takes deep skill, but mountain climbing includes drudgery and perseverance. Your reference to Arlene Blum’s book (which I have not yet read) expands beautifully on the idea of writing as a mountain climbing experience, fraught with danger, but oh so exhilarating. I’m glad you can relate to this analogy and maybe use it as you continue with you own life story, Audrey. Thank you – and cheers to the next chapter! 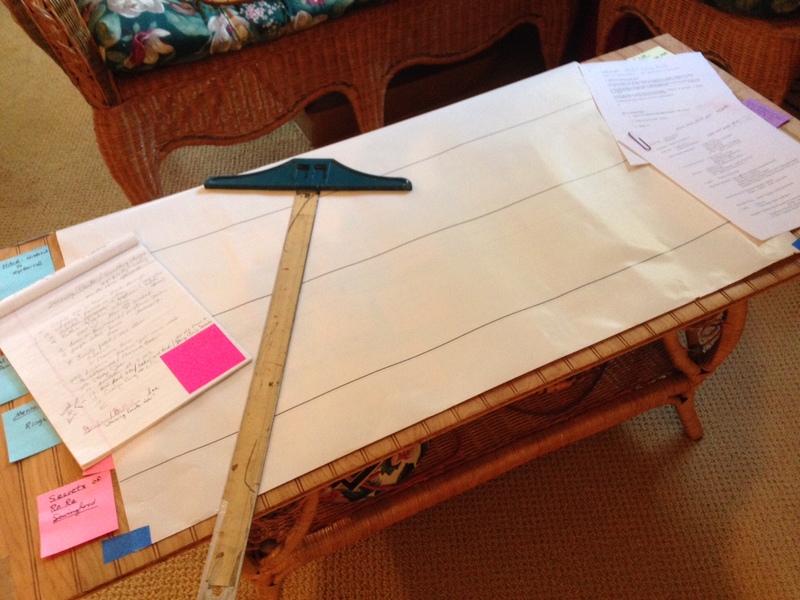 Marian — I love the photos you shared of the way your story board has morphed as you change tactics. And even though you’ve shifted gears, nothing was lost because you learned along the way. When I crack the cover of a book, I eagerly wait to hear/feel the “click” of connection in the first few pages. And even though reading memoir is a story about someone else, I look for something that I can relate with and then we’re off and running! Just yesterday I finished reading and reviewing a memoir (The Skin Above My Knee) whose author’s experience is totally different from mine: geography, religious orientation, career choice, moral values. Yet, her story was gripping because her she struck the universal chords of emotion: feeling different, feeling misunderstood, feeling alone – but eventually experiencing a transformation. I appreciate your confirmation: “nothing was lost because you learned along the way.” Thanks for another bit of encouragement, Laurie. I hope Shirley sees your heart-felt comment, especially because your reading the story through a different prism didn’t prevent you from feeling and hearing the emotion in her voice. When I read BLUSH, I felt she had written my story because we share the same origins and religious upbringing. About hearing the rhythm by reading aloud: I used to tell my composition students to do that, but I’m pretty sure most did not follow through because it takes time and effort. About a month ago, I learned that a young memoirist discovered reading aloud a good editing tool for her debut book, so I’ve picked it up again for my own work. Thanks, Susan! This was very interesting to me because I have tried and have lots of short stories to put together to make my life story. It’s a very big job! I’ve also worked on my parents story, it’s much more interesting than mine! But you are encouraging me so I’ll try to get back at it. My parents story is worth reading! Mine, not so much! Thanks for sharing this with us. Your words sing when you write about your parents and grandparents. Perhaps that the place to start. I think your story is definitely worth telling too, but maybe not just yet. It’s good to see your smiling face again today. Thanks, Anita! What a feast for another struggling memoirist here. Whether or not your memoir is ‘finalized,’ your regular posts here are super successful. They start out a cappella as a single voice but soon break out into 3-part harmony, soprano, second soprano, alto. Lovely! It brought tears to my eyes; I played the 2 1/2 minute segment twice. And I’m sure I’ll listen to it again. Thank you so much, Dolores. You have encouraged me here more than you know. I’m glad the hymn speaks to you too. Hi, Marian, Love this post. We all have our lives’ memory banks, but how to organize them? That is the tough question, answered sometimes by asking yourself, “What do I want my readers to take away from my life’s story?” If one can answer that, there is the secret to organization. An example, The memoir just finished – No One’s Easy Daughter, Our Journeys of Transformation – started out to answer the question – “What was it like to be a nun in the days of long habits and heavy rules? Answer – We will do a documentary story of way of life that is no more.” But that Questions soon morphed into a much broader one, “How did our lives as women in the convent affect who we are now, and why?” And then as we got into more and more stories, the Question deepened to “How to explain the life journey of transformtion open to each of us, not just women, but everyone?” And that last question on top of the other 2 gave us our book. Hope this example is meaningful. Yes, the example is meaningful, especially since I’ve read and reviewed your book this summer. As I see it, you are saying the developing story evolves, sometimes into something much deeper (and more universally applicable) than one we imagined at the outset. One thing I know for sure in my own memoir, I am documenting a way of life that no longer exists, at least in the particular way I lived it. My memoir will most importantly be a legacy for those who follow me in the family line. How brave of you to write your memoirs, Marian! I would love to read them. I haven’t read many memoirs, but loved Marlon Brando’s ‘Songs my mother taught me’: a beautiful and endearing story and it explains a lot about his character. I loved the humour in it too. You might find it helpful. Best of luck with your writing. Thanks for the good wishes and for the tip about Marlon Brando’s memoir. I’ll search to see if our library has it. I wouldn’t have guessed from his “onstage” persona that his story would contain very much humor, but that’s why we read. Right? It’s always difficult to lay your life open, like flaying a piece of meat with a sharp knife, and seeing the inside. We aren’t always pleased at what is presented. But it is us, our soul, and sometimes what is exposed is hard to come to grips with. Making sense of your life is not for the faint-hearted. I read memoirs and seek the kernel of words that resonates with me, that assures me my own life is a lesson in resilience. Your metaphor about the pain of discovery is spot on. I have had to confront some painful encounters in my past as all memoirists do, and I agree finding sense of one’s life is not for the faint-hearted. I like the wisdom in your lines: “I read memoirs and seek the kernel of words that resonates with me, that assures me my own life is a lesson in resilience.” Thank you for reading and commenting here. You are always welcome, Ginger. I’ve thought of taking breaks to re-group but never quitting. I simply can’t deprive my children and those who follow a record of a life they can even now scarcely imagine. Thank you for your vote of confidence and for being the first one to fill in the blank. Yay, Darlene. It will come together, and you’ll then be qualified to teach your own course! 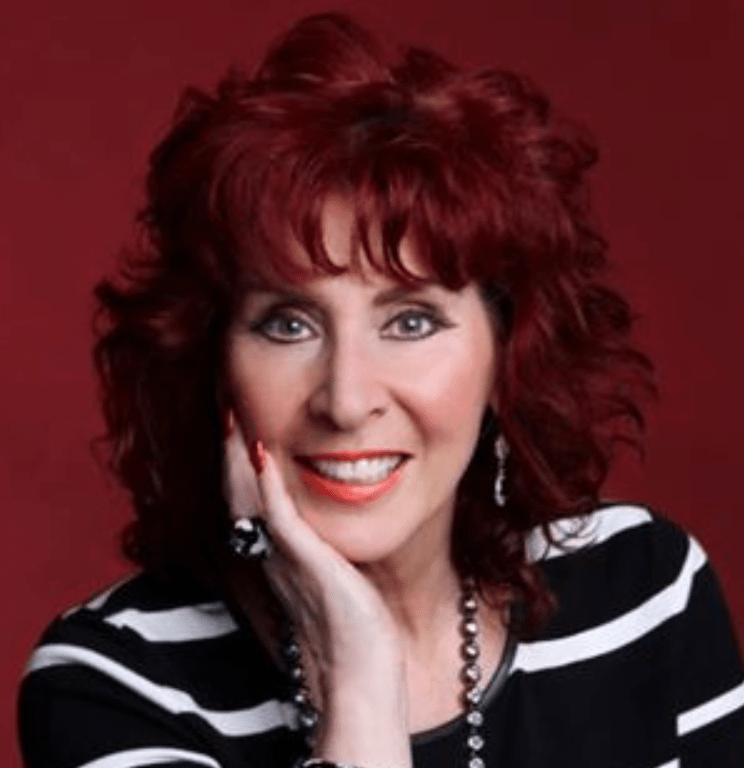 Good practical experience tips and method here and at D. G. Kaye’s–plus the wisdom of so many faithful blogging friends! I do admire your following here, who will be anxious to see the story of Marian!! I appreciate your word of prophesy, sister Melodie. Yes, I see the story of Marian materializing one day with the help of so many like you in my cheering section. Thank you! Wow. Look at all those steps. I would have gone all Willy nilly writing without direction. However, you quite clearly illustrate that necessity of laying all the events out. Thanks for commenting here again, Jennifer. Adventures in your own unique style of life in the Big Apple would make for quite an interesting read I would think. And who says I won’t go willy nilly before it’s all over – ha! Thanks, Carol. Ginger mentioned about “laying yourself open” and peering at what’s inside. I guess because I draw courage from others, I’m willing to take the plunge too. 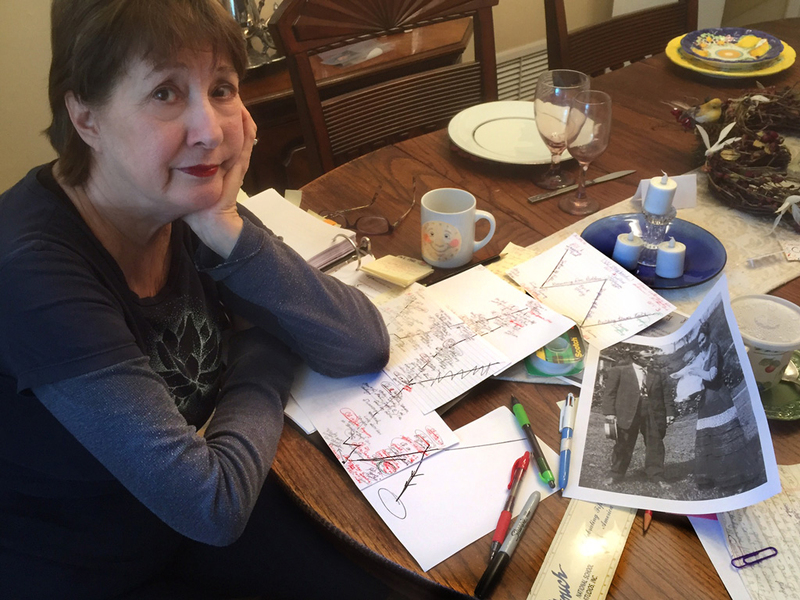 Also, memoirists are capturing part of an era in history as they record their own life events. I appreciate your vote of confidence. Hi Marian. Had to get back to comment on your engaging post, packed full of useful tidbits of experience. I loved the photo of you; you definitely captured that “Drat!” feeling, which all memoirists maybe all authors have come to at some point on our journey. And the “what’s the story about” is such a good place to start, though it’s not often obvious until we are well into it. Enjoy the journey; you’ll miss it when it’s over. You’ve been there. done that – actually more than once. I have heard the comment “you’ll miss it when it’s over” before. Some day I’ll get there and prove that it’s true. O Happy Day! Wow Marian, I’m humbled and flattered for the mention here. Thank you. In answer to your open Myth question . .If you haven’t worn the shoes. I’m aiming for your goal too, one you’ve achieved based on all your fab reviews. Sometimes I think I take myself too seriously because some of what I’m writing about is sensitive material. (You know what I mean.) I do best when I write imagining the legacy I’m leaving for my children and grands that follow. You have written about your writing process. Have you ever written about your writing space? Maybe you have. If not, curious readers want to know. Thanks for your gracious comment here and for the great advice in the post. OH, thanks for digging me out of spam Marian, lol. Sheesh,. it was cramped in there. And I know what you mean about ‘sensitive’ material. It’s a certain kettle of fish who can bare the soul, and it takes time to get used to, trust me. But now when I give my manuscripts for beta reading and I’m told to get back to the ‘Debby writing’ on my recent MS and stop trying to duck away from your words, I get the encouragement to say what I mean without dodging around. We all need a little encouragement from time to time, just like reviews validate our writing somehow. Ah, thanks for the follow-up here. I will indeed check your blogshare tomorrow, Debby! Besides the gorgeous photos of your family and the tea party preparations and sipping, I love the photo of you “dratting.” Makes me feel better about my own irritations. You’ve helped a lot of people in big ways in the last two years. Caregiving is hard on writing time, so I’m glad you’re back at your writing desk. Although I’m a mapper in the rest of my life, it doesn’t seem to work for writing or imagining a narrative. So, I post ideas in a word file where I can find them–under categories I’m writing about. I tend to pile up scenes before creating order, knowing where I’m going, and filling in the spaces between. I do this for short pieces and especially a long narrative. I have a general idea where I’m going with my present project (still unfolding, but the idea is emerging and clarifying) and questions to help me weave memoir and mythology. ‘Leaning into Love’ began with the climax moment of Vic’s death when everything changed in my life and the challenge began. In time, and especially after having one reader say, “I read your beginning and I don’t care about you, so why should I continue reading. Don’t take this personally. It’s about the book, not you.” Of course I took it personally, but in the end I was so grateful. It sometimes pays to have a reader who isn’t a friend or a fan but comes to it fresh. She was that. I re-created the beginning with a self-portrait that made people care what happened next in a dramatic transition between being a caregiver and partner to life on my own. About care-giving: I found Roz Chast’s memoir on care-giving in an odd place. It had hopped out of my book shelf, I guess because I was going to give it to my sister, thinking that our family care-giving was all over. Now another family member is emerging as physically needy so I am hesitating. Maybe the book will become a blog post topic before I hand it over. Cartoonist Chast was alone with both parents in dementia. After it was all over, she turned her experience into a graphic memoir; maybe you’ve read it. Thank you for taking the time to detail you word file practice. If it works for you, keep doing it, I say. Fie on formulas that don’t work for everyone. I also like your mentioning the squinty-eyed reader who disputed your original opening. Even well-intentioned criticism stings. The one whom you described sounds tactless, but she obviously meant well. Still, you ended up with a prize-winning book! It’s not easy finding the right arc, drama points or how you want to tell your story. So good luck! How right you are, and you should know. You find just the right “arc” whenever you post. Best wishes as you visit your mum in Sussex. It should be very pretty this time of year. Thanks, Lady Fiona. Wow–that looks like a LOT of work! I’m sure the results will be totally worth it, though. I commend you for your dedication and look forward to reading the results! Oh, Rebecca. You are SO right, it is a lot of work, but in the end, worth it I hope. I feel compelled to write this memoir as a legacy to the “grands” that follow. Now that others (like you) have expressed an interest in reading it, I feel obliged to make it as polished as I can. I’m sure other beta readers and a professional editor will have a hand in that. So good to see you here again. Do give my regards to Sage. I wonder what he will look like on Hallowe’en night. Quite a fright, I’d imagine. You seem to have come a long way with your rmemoir already, Marian. The fact that you can now “play around” with he chapters and sections means your first draft (maybe even second?) is done. Isn’t writing the initial draft the hardest? That’s what I am telling myself, since that’s where I am with mine right now. But, I’m sure that is just the start and the tip of the iceberg. Transforming the story you want to tell in a neat, attractive and compelling package must be the hardest thing!? The more I read about memoir and the more I am trodding along with mine, the more I feel like I will need some professional help at some point. Not so much with creating the stories, adventures and highlights – that is what my life is about after all – but with the right angle, format and all that good stuff. Great post! Hello and welcome, Liesbet! I read your comment here and then poked around in your own website and left a comment. I get the impression you have strong intention and careful focus, and even have some writer friends who support you. Another way I moved ahead with memoir manuscript was taking a writing course. If you haven’t explored that, you may want to take a course online. About professional help. Yes, a professional editor is in the cards for me very soon. Thanks for reading and commenting here. Big cheers for your progress. Write on!